As a tribute to Peter Maxwell Davies, who died in March, another chance to hear his opera Taverner in a performance given at City Halls, Glasgow, conducted by Martyn Brabbins. 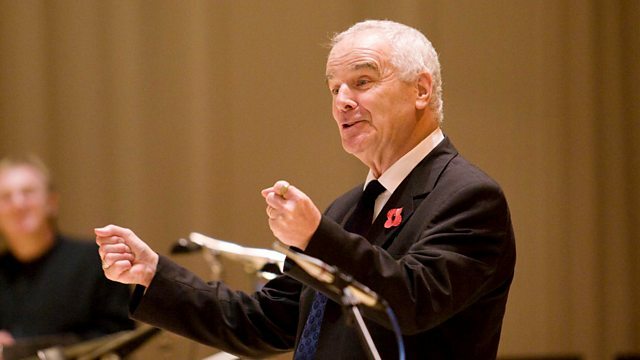 As a tribute to Sir Peter Maxwell Davies's who died last month, another chance to hear his iconic morality opera Taverner, recorded at City Halls, Glasgow as part of the mini-festival which celebrated his 75th birthday there in 2009. This production brings together the BBC Scottish Symphony Orchestra, a cast featuring the best of British vocal talent and combined choirs. Begun in 1956 and premiered in 1972, it is considered by many to be one of the composer's greatest creations. It is based on episodes from the life and times of the English Tudor composer and recounts John Taverner's religious and personal journey from believer to persecutor. Presented by Tom Service with contributions from the composer and performers. Singer: Daniel Norman. Singer: Richard Angas. Singer: Martyn Hill. Singer: Stephen Richardson. Singer: David Wilson‐Johnson. Singer: Roderick Williams. Singer: Andrew Watts. Singer: Michael Yeoman. Singer: Alasdair Roberts. Singer: Stephen Jeffris. Singer: Christopher Bowen. Singer: Susan Bickley. Choir: RSAMD Chamber Choir. Choir: University of Glasgow Chapel Choir. Choir: University of Glasgow Chapel Choir. Choir: Royal Scottish National Orchestra Junior Chorus. Choir: Royal Scottish National Orchestra Junior Chorus. Orchestra: BBC Scottish Symphony Orchestra. Orchestra: BBC Scottish Symphony Orchestra. Conductor: Martyn Brabbins. Conductor: Martyn Brabbins. Singer: Daniel Norman. Singer: Richard Angas. Singer: Martyn Hill. Singer: Stephen Richardson. Singer: David Wilson‐Johnson. Singer: Roderick Williams. Singer: Andrew Watts. Singer: Michael Yeoman. Singer: Alastair Robertson. Singer: Stephen Jeffris. Singer: Christopher Bowen. Singer: Susan Bickley. Choir: RSAMD Chamber Choir. Choir: University of Glasgow Chapel Choir. Choir: Royal Scottish National Orchestra Junior Chorus. Orchestra: BBC Scottish Symphony Orchestra. Conductor: Martyn Brabbins. Performer: Jean-Efflam Bavouzet. Orchestra: BBC Philharmonic. Conductor: Gianandrea Noseda. Taverner is on trial before the White Abbot, accused of following the Lutheran heresy. Witnesses are heard, and the chorus comments, but before judgement can be given Taverner is saved by the intervention of the Cardinal (not named as Wolsey), who needs him for his art. Taverner debates for himself the religious meaning of his music, while monks chant. Then the scene shifts from chapel to throne room, where the King is instructing the Cardinal to obtain him a divorce, while both seem to be puppets in the hands of the Jester; the orchestra here is silent, the scene being accompanied by music for Renaissance period ensemble. The Jester, or Death as he becomes, then calls forth Taverner (and the orchestra). Taverner is confused by cheapjack religious stunts, and brought to seize a sword against Catholic iniquities. The second act is again in four scenes, and is a black version of the first. There is first another trial, nightmarishly accelerated, in which Taverner is now the judge and the White Abbot the accused, the crime this time being that of adhering to the old religion. At the climax a Wheel of Fortune appears, ridden by the Jester. Then comes a second throne room scene, again accompanied by Renaissance instruments, though now in tart parodies of period dances and keyboard pieces that carry the action forward through the sixteenth century. Monarch and churchman discuss the progress of the Reformation, while the Jester revests the latter as an Anglican Archbishop. The second chapel scene has the White Abbot and his monks at mass, while Taverner criticizes himself for his earlier credulity. A captain enters and spills the consecrated wine, whereupon the monks leave, singing an original Benedictus by Taverner. The final scene is then a big choral tableau in which the White Abbot is brought forward for burning at the stake, and in which Taverner becomes aware that he has destroyed the better part of himself. - Synopsis kindly supplied by Paul Griffiths and Boosey & Hawkes.